Pistachios are some of the most beloved nuts, so of course, this Pistachio flavored coffee is deliciously perfect. Imagine fresh roasted pistachios� and now, imagine fresh roasted pistachios and coffee blended together to create a heavenly creation of smooth nuttiness. Warm and decadent, this coffee creation features a uniquely gourmet flavoring that will coat your taste buds in a one-of-a-kind unique coffee experience. With 2 calories in each cup, you can indulge in this pistachio flavored treat and all of its nutty goodness. Roasted, packaged, and shipped on the same day, this Pistachio flavored coffee will hit the spot with its fresh-roasted flavor. Sent in a heat-sealed valve bag, this Pistachio coffee will be the fresh and flavorful � giving an exceptional flavor to each and every cup of coffee, along with a wholesomely nutty aroma. 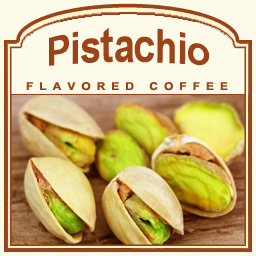 Indulge in your favorite nut with this Pistachio flavored coffee!